Want to learn more about craft work, and contribute to a good cause? 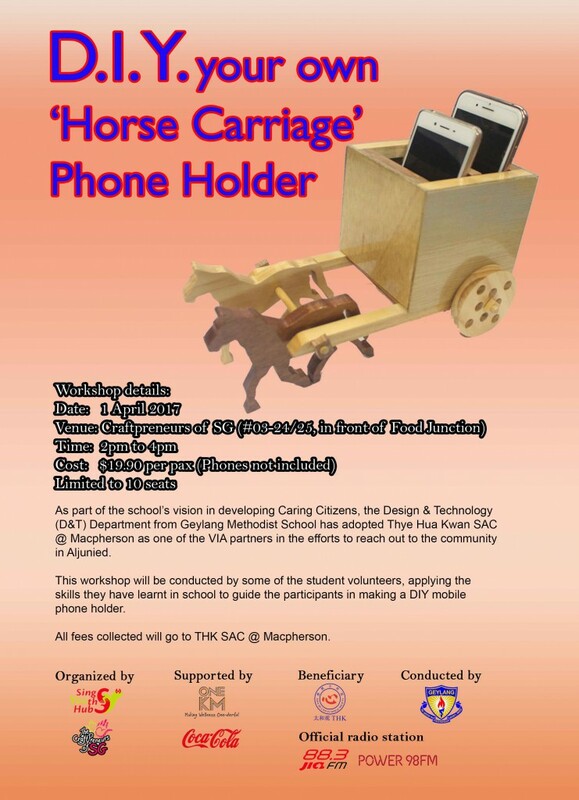 Then join student volunteers from Geylang Methodist School (Secondary) at DIY workshop, as they show you how to make your very own “Horse Carriage” design phone holder! Craft work is an initiative by Design & Technology Department from Geylang Methodist School (Secondary) which has adopted Thye Hua Kwan SAC @ Macpherson, and your support will help give senior citizens an opportunity to stay active and engaged! Happening 01st April, 2 – 4PM, only at ONE KM Mall! This message is brought to you by Geylang Methodist School (Secondary)!